If your dog is scratching at or shaking his head, the culprit might be Otodectes cynotis hiding out in their ear canal. Otodectes cynotis, also known as “ear beggar of the dog” is a tiny arachnid, among the family of spiders and ticks. What these tiny critters do is squirrel away in the ear canals, feeding on the wax and oils in your dog’s ears. Their presence causes itching, thus the scratching done by your pup. While the parasites themselves don’t bite the skin, the secondary damage done by your dog’s claws can be far more serious. It is important to clear up an ear mite infestation as soon as you suspect one. What are the symptoms of dog ear mites? Itching: The first sign of an ear mite infestation is your pup scratching his head. Dark, crumbly reddish-brown discharge: This is often composed of dried blood, similar in appearance to coffee grounds. Wounds, inflammation, and infections: The dog scratching may lead to cuts and infections in the ear(s). 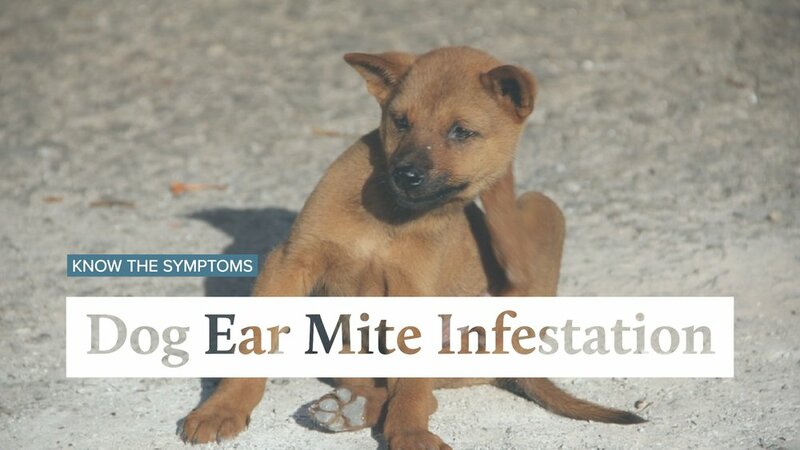 The most common sign of a mite infestation is a scab or abrasion at the base of the ear, which is the result of the dog scratching with his hind limb claws. If bacteria has infected the open wound(s), you may find an infection. In heavy ear mite infestations, the ear mites might start to invade other parts of the dog’s body. It is important to eradicate ear mites as soon as you possibly can, both for the good of the infected dog, your other pets, and stranger’s pets your dog may interact with. Ear mites can easily spread to cats and ferrets, as well. If one animal in the household is diagnosed with ear mites, all pets should be treated at the same time. Although rare, these mites can also spread to humans. Although Googling recipes for home remedies is an option you may feel compelled to try, it is wiser to visit your veterinarian for a proper, definitive diagnosis and treatment. There are several other ear conditions that mimic mite infestations, so you want to make sure your treatment is right for your pup to clear up the issue the first time. How are ear mites treated? The first step in ear mite treatment is a vet’s examination of the ear canal and the discharges from the ear for the possible presence of mites. They are easily spotted with the aid of an otoscope. The next step would be a thorough ear cleaning, followed by application of products approved for treatment of ear mites in dogs, such as selamectin, moxidectin/imidacloprid, all of which is often used against a range of parasites. Bacterial or fungal infections should also be treated. Prevention is a matter of monthly topical anti-parasite application and keep your dog’s ears clean.